Slowly but surely an extinct glacier in a remote corner of the Peruvian Andes is being returned to its former colour, not by falling snow or regenerated ice sheets, but by whitewash. But there is debate between those who dismiss the idea as just plain daft and those who think it could be a simple but brilliant solution, or at least one which should be put to the test. The World Bank clearly believes the idea - the brainchild of 55-year-old Peruvian inventor, Eduardo Gold - has merit as it was one of the 26 winners from around 1,700 submissions in the "100 Ideas to Save the Planet" competition at the end of 2009. Mr Gold, who has no scientific qualifications but has studiously read up on glaciology, is enthused that the time has come to put his theory into practice. Four men from Licapa, the village which lies further down the valley, don boiler suits and mix the paint from three simple and environmentally-friendly ingredients: lime, industrial egg white and water. The mixture which has been used since Peru's colonial times. The US Energy Secretary, Steven Chu, has endorsed a similar idea using white roofs in the United States - possibly more pragmatic than painting mountains. Changing the albedo (a measure of how strongly an object reflects light) of the rock surface, would bring about a cooling of the peak's surface, says Mr Gold, which in turn would generate a cold micro-climate around the peak. "Cold generates more cold, just as heat generates more heat," says Mr Gold. "I am hopeful that we could re-grow a glacier here because we would be recreating all the climatic conditions necessary for a glacier to form." The 900-strong population of Licapa, the village which depends on Chalon Sombrero for its water supply, did not think twice about accepting Mr Gold's proposal and the funding it would bring. "When I was around 15-20 years old, Chalon Sombrero was a big glacier, all white, then little by little it started to melt," says 65-year-old Pablo Parco, who is one of the project's supporters. "Forty years on and the river's never been lower, the nights are very cold and the days are unbearably hot. It wasn't like this when I was growing up... it was always bearable. "So we're happy to see this project to paint the mountain. I can tell you this morning there was snow on the ground, something we rarely see. "Up here we live from our animals, up here there's no work, there's no crops, when there's less water, there's less pasture and that means less livestock." In Peru, home to more than 70% of the world's tropical glaciers, global warming has already melted away 22% of them in the last 30 years, according to a World Bank report of 2009. The remaining glaciers could disappear in 20 years if measures are not taken to mitigate climate change, it adds. The impact would go way beyond Andean communities, with dramatic consequences for the water supply on Peru's populous coast and hydroelectric power. In May, Peru's environment minister, Antonio Brack, said Peru would need $400m a year to mitigate climate change. He is one of the sceptics who is not prepared to give Mr Gold's idea the benefit of the doubt. "I think there are much more interesting projects which would have more impact in mitigating climate change and that's where this money should be invested," he told the BBC. But the ministry's climate change chief, Eduardo Durand has said: "Every innovative idea has the right to be heard" and has given the pilot project the green light. "On a local scale, it might have an impact, it might change a trend, improve things a little," says Thomas Condom, a glaciologist and hydrologist working at the French Institute for Research and Development, which has been monitoring tropical glaciers in the Andes for the past 15 years. "But the impact is bound to remain local, it is not going to reverse or stop a trend on the scale of a whole region. 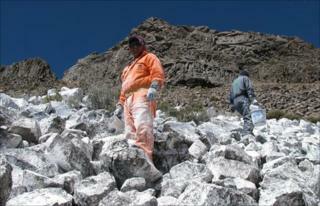 It would be very difficult to do something similar on a very big scale in the Andes." A report by the UK's Royal Society in 2009 said the technology of "geo-engineering" projects was still "barely formed" and governments should continue to focus on cutting carbon emissions. But if Mr Gold's pilot project proves successful in pushing down the temperature, he envisages expanding it to Peru's most threatened glacial regions on a large scale. "I'd rather try and fail to find a solution than start working out how we are going to survive without the glaciers, as if the situation was irreversible," he says.